Barclays PLC has many problems, but to me, this one is the most important. Followers of Barclays PLC (NYSE:BCS) can probably list several major problems facing the bank today. There's the aftermath of the LIBOR-rigging scandal. There's the market turmoil facing European banks across the board, particularly on the southern end of the continent. There's the revolving door in the CEO's office during the past five years. Those problems are all very real and very serious. However, I see a much more fundamental and much simpler problem that's far more important than all of these other challenges. Barclays' biggest problem is its abysmal return on equity. Its revenues lag, its costs are far too high, and its balance sheet has more leverage than its peers. Improving return on equity starts with the bank's top line. The more money a bank brings in relative to its assets, the easier it is to turn those dollars (or British pounds) into bottom-line profits. Barclays falls short of many other large banks in raw dollar terms, as well as a percentage of assets. The table below illustrates the point, comparing each bank's trailing 12-month revenues with its total assets as of December 31, 2015. The higher the resulting percentage, the greater the bank's ability to generate revenue from its assets. Barclays brings up the rear at just 2.34%. JPMorgan Chase and Citigroup are both American banks, so this comparison is not exactly apples to apples. However, it is still telling that both the larger JPMorgan and very comparably sized Citigroup can generate such a significantly higher level of revenue for every dollar of assets on their books. HSBC, another bank based in the U.K., trails the American banks, as well, but still beats Barclays by 14 basis points on this trailing 12-month basis. Moving down the income statement, a bank must have its costs under control to generate the maximum possible profits from its revenues. Again, Barclays has serious problems here. The costs-to-income ratio, or efficiency ratio, is a good proxy to assess a bank's cost structure. A lower efficiency-ratio percentage is considered more efficient, representing fewer costs required to generate the bank's revenue. For the fourth quarter, Barclays reported a costs-to-income ratio of 69%. Among the largest banks with better performance, efficiency ratios have been in the low 60% range in recent quarters. JPMorgan and HSBC reported efficiency ratios of 60% and 62.6%, respectively. Citigroup's struggles have been much worse; its efficiency was 81% for the fourth quarter. For Barclays to generate meaningful improvements in its return on equity, it must find ways to reduce its efficiency ratio into the low-60% range, if not lower. After revenues and costs, the final component in return on equity is a bank's balance-sheet leverage. In this regard, Barclays leads the pack; but that isn't necessarily a good thing, either. With higher assets relative to equity, the extra assets should generate more earnings relative to equity -- in other words, higher returns on equity. In this way, leverage can be an effective financial tool to boost returns, but it comes with increased risk. A more-leveraged balance sheet is more susceptible to capital shortfalls if the bank produces losses. BCS Assets To Shareholder Equity (Quarterly) data by YCharts. 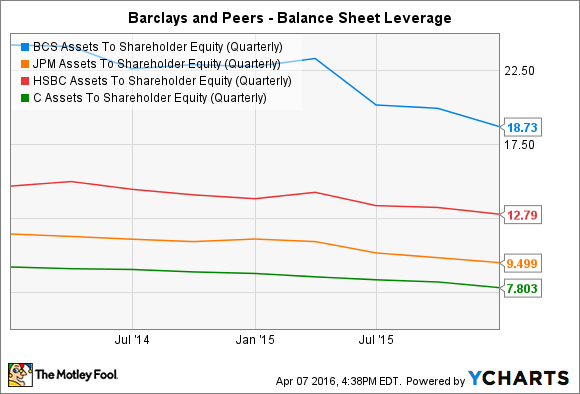 Among the peer group here, Barclays' assets-to-shareholder-equity ratio is by far the most leveraged. The bank's profits have been so low in recent years that even this high leverage ratio can't pump up return on equity. It's hard to justify the risk of a highly leveraged balance sheet if it isn't directly driving better shareholder returns. To tackle these problems, Barclays hired CEO Jes Staley, a JPMorgan alumnus, to lead the company. Since he started in December of last year, he's quickly put forth a strategic plan to address each of these problems one by one. In his letter to shareholders in the bank's 2015 results announcement, Staley laid out a three-pronged focus to turn the bank's financials around. The first priority is, not surprisingly, increasing return on equity. The primary plan for this is to sell off non-core businesses that are holding back the bank's core performance. As those lower performers are sold off or shut down, the bank's return on equity should increase naturally to the higher levels of the core businesses. Second, the bank is seeking to increase its capital base to a level 1% to 1.5% higher than the regulatory minimum level. This is the start of Barclay's building a "fortress balance sheet," a term made famous by JPMorgan CEO Jamie Dimon, and it should also reduce the bank's assets-to-equity ratio and balance-sheet risk. Last, the bank is prioritizing its efficiency, and improving its cost structure. Barclays had a cost-to-income ratio at 69% in the fourth quarter. Staley has set a long-term target of 60% for the bank, which would be in line with levels seen at high-performing large banks around the world. It's easy to recognize that Barclays has a return-on-equity problem. It's also easy to prescribe a solution. It's much, much more difficult to actually implement the changes necessary to see these initiatives through. Jes Staley is a proven leader in the banking industry. The challenge he faces today at Barclays will be the greatest of his 30+ year career.